The Billy Bob Goofy Toofers come in packages of two assorted styles. Molding pellets not required - just slip the Goofy Toofers on over your own teeth for an easy and comfortable fit! 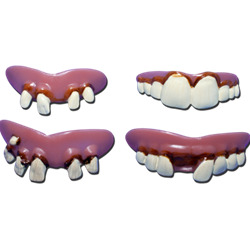 These inexpensive teeth are a great way to add detail to your costume. Excellent for pirates, nerds, zombies, and lots of other creepy and kooky characters!